Martin County Sergeant Placed On Investigation After Car Crash In Jensen Beach | Schuler, Halvorson, Weisser, Zoeller & Overbeck P.A. 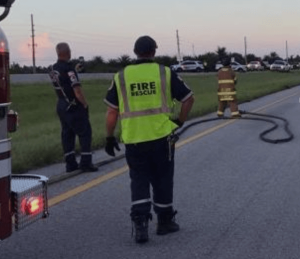 A Martin County sheriff’s deputy responded to an accident on southbound Interstate 95 between Jensen Beach and Port Salerno exits, under the Route 24 overpass, Florida Highway Patrol officials said in a statement. A 2001 Dodge Stratus was headed south in the middle lane when it was cut off causing the driver to lose control, Florida Highway Patrol officials said. The Stratus stalled in a lane that acts as both an entrance and exit ramp. The driver could not restart the car and walked to safety on the right side of the road, the Florida Highway Patrol officials said. A few minutes later the abandoned car was hit from behind by a police cruiser driven by a 28-year-old Martin County Sergeant, who was on duty for the sheriff’s office, said the Florida Highway Patrol. The officer was taken to a Shock Trauma Center in Port Salerno and was in good condition. The 28-year-old Martin County Sergeant has been placed on administrative leave. The Florida Highway Patrol officials said, alcohol or drugs may have been a factor in the accident, however, the investigation is still ongoing.